A few weeks ago in Algebra II I had students fill out a series of questions… questions which was going to lead to a discussion about mathematics and intelligence. I cribbed this sheet from my friend and teacher extraordinare Bowman Dickson. I didn’t capitalize on it immediately, but I think I can still get some good mileage out of this. The thing that brought me back to this sheet was that yesterday in Algebra II, I gave an assessment that students didn’t fare as well as thought they would. With one section, today, I had a heart to heart with them about what I saw, and this disconnect, and I talked a lot about the difference between active learning and passive learning. I think I got through to them. And I said: take what I said to heart. Be an active learner. And I’m going to give you an assessment on the same material next week. 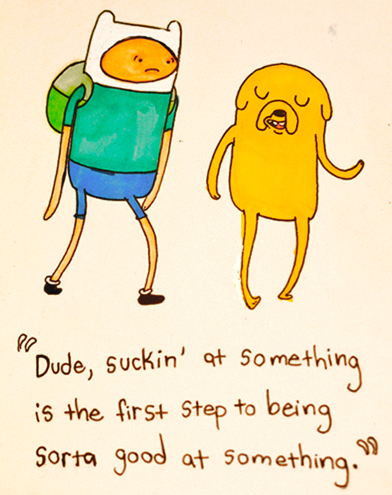 Show yourselves that you are capable. Because I know you are — but you just need to learn and implement the right strategies to be able to do it and make a lasting change. So we’ve had the talk about the concrete things… and I think next week, after kids take the reassessment (and hopefully — HOPEFULLY! — do much better), it would be worth it to have a talk about the more abstract side of things… attitude. The way students approach math, think about math, think about intelligence. I’d love for any ideas about how to structure/have this discussion. I’ll throw my class data below, but if I’m going to do this, I want whatever I plan to be as powerful as possible. I want it to really get kids to think about what learning is, and how important having a growth mindset is. I have a few thoughts, but nothing great. So any brainstorming you might have, awesome. Yeah, I want that DOUBLE POSTER SIZE in my classroom. I’ve been thinking deeply about these sorts of questions recently, too. My recent thoughts were about how we, as humans, do have some base in logic. We have a shared sense of what makes sense and what doesn’t. Even if you disagree with someone’s opinions or even some actual facts, you will convey this by appealing to some logic which is central to humanity. I then tried to think about a concept that radically changed and why it might have, so I thought about the earth-centered solar system theory. It made sense to everyone for the longest time. Then we gathered more data and looked at models. Moments ago, I came across this: http://dd.dynamicdiagrams.com/wp-content/uploads/2011/01/orrery_2006.swf Use the bottom right to switch models. Which is “right?” I don’t know that we can say, but the solar-centered one certainly is more pretty and makes more “sense” to me (that all the planets would travel in a circular pattern rather than wobbly circles or weird limacons)–and I don’t think that’s just because I grew up with that theory. The point is, I feel like there is some basis of logic that we all have and that mathematics is meant to appeal to that common thought. If we focus only on the end results and memorize formulas or only worry about answers or use our calculators for everything, then we miss all the logic and it DOESN’T make sense to us. But, there IS a deeper meaning to most of this stuff we’re talking about (even in Algebra II) and if you start asking WHY instead of HOW, you’ll start to see it, too. I recently finished reading Blink by Malcolm Gladwell. In it he discusses priming and how putting people into certain mindsets affects their performance. I have no doubt that a students attitude toward their math directly affects their performance. In the book Malcolm talks about a Dutch study where some students were primed to think smart and others were primed to think not-smart. The difference in performance on a series of difficult Trivial Pursuit questions was 55.6% versus 42.6%. I am presently trying to figure out how to prime students before a test. Can I do something similar to that Dutch study and attempt to put my students into a “smart” frame of mind at the start of each test? And it’s not that I’m after the boost in test scores… I believe the positive effect on student’s attitudes and performance long term by “artificially” improving their performance will reap it’s own rewards. If students can suddenly see themselves being successful then I’m hoping that eventually they won’t need to be coerced into putting themselves into a “smart” frame of mind. To what degree do your student answers match your own? 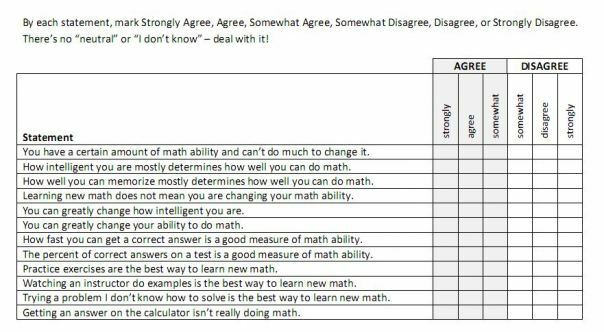 Match the general attitudes of math teachers at your school? I am concerned that your students know what you want to hear. Its still a good tool to start a discussion, but I hypothesize that the data is inaccurate. Not to be a downer, but I think Scott is right. These answers do not reflect what my students actually believe, more like what they think they should believe… though my students may be totally different than yours? I really like the results from the “Trying a question I don’t know how to solve..” question. It shows that students want to be challenged. I too have concerns about the validity of the data. BUT, as is said above and @samjshah seems to have indicated, this is a beautiful data tool and example of caring teaching that oils lead to wonderful conversation, in the classroom and/or with colleagues. Cool. I somewhat agree. Kids at my school tend to be fairly honest, and when I ask them to, they are really reflective. I’m always surprised with the comfort they have expressing their thoughts to teachers, even when it’s not what the teacher “wants” to hear (or what they think the teacher wants to hear). Not all kids, of course, but a lot of them. That being said, I would NEVER call this data anything more than a jumping off point for a conversation. The accuracy of the data isn’t all that important.